"A man not old, but mellow, like good wine." The general manager of Benevino Vineyards is James Benefiel, who until this year, has been among top 10 independent growers in the state. He has since lost his independence by starting his own wine production. 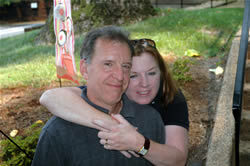 Wines from his Benevino Vineyards grapes have won awards at competitions not only in Virginia, but across the country. Recognition of his devotion to quality have led to not only long-term grape-supply contracts, but also to contracts to develop vineyards before any grapes have been planted, which breaks new ground in this state. Mr. Benefiel is a graduate of the U. S. Naval Academy and a former nuclear submarine officer with a Master’s Degree in Business from the Wharton School of the University of Pennsylvania. He is currently employed as a Director of Product Management for a software development firm. As such, he looks at winegrape growing with a scientific and businessman’s perspective. Mr. Benefiel has immersed himself in the study of soil and site characteristics that lead to premium wines. 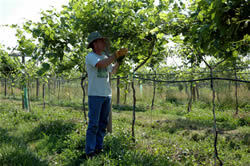 He has researched varieties, clones, and rootstock evaluations. 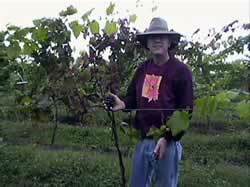 He experiments with trellis enhancements to improve the ripeness of every grape allowed to ripen. And he maintains detailed production records of subsequent grape quality as of function of these conditions. Mr. Benefiel is committed to premium winegrape and wine production, and offers such services to the small grower to raise the bar on Virginia wine quality. “I love cooking with wine. —attributed to many, but one of Nancy Benefiel’s guiding policies. 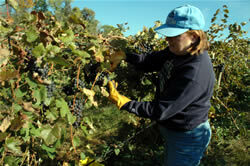 Nancy Benefiel is the co-owner and marketing chief of Benevino Vineyards. She has a public relations degree from George Mason University, and has been a store manager of two women’s fashion chains. She is a gourmet cook, having taken classes at the Culinary Institute of America, at COPIA, and in Tuscany, Italy. Sharing her love for the wine country lifestyle, she enjoys presenting food and wine pairings. She has been instrumental in getting Benevino wines recognized in specialty stores and restaurants. The Benefiels are hands-on growers, meticulously maintaining the canopy of the vines to maximize ripeness and wine quality. They thoroughly agree with the adage that good wine is made in the vineyard. You can make fair wine from excellent grapes, but you can’t make excellent wine from fair grapes. .